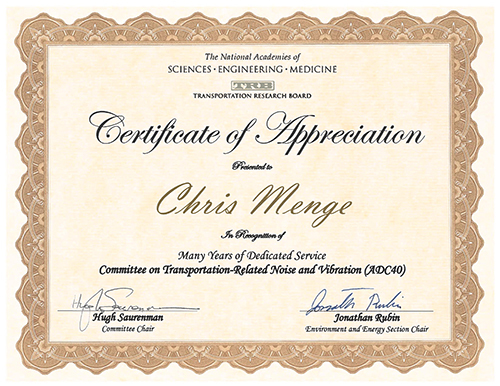 HMMH is pleased to announce that Senior Vice President Chris Menge has been honored by the Transportation Research Board with a Certificate of Appreciation for 40 years of service to the Committee on Transportation-Related Noise and Vibration (ADC40). This certificate was given to Chris during the ADC40 committee meeting at the 97th TRB Annual Meeting in Washington, D.C. In 1978, Chris and his research partner Neville Powers presented a report on their early research on materials for sound absorbing noise barriers. He was also one of the pioneers in developing algorithms and software to optimize highway noise barriers for cost-effectiveness, along with his colleague Grant Anderson. These 1978 presentations were given at the first meeting of the TRB Committee on Transportation-Related Noise and Vibration in Los Angeles, California. During the following two decades, Chris was a developer and author for the FHWA’s STAMINA/OPTIMA and Traffic Noise Model (TNM) prediction software and user’s manuals. Chris has continuously studied the development of all aspects of highway noise prediction and abatement, with his findings published on a regular basis since his first presentations to TRB. Chris has also been a recipient of HMMH’s Founders Award in 2016, 2014, and 2013 in recognition of his work on various research projects.